The apartment Rybna 24 located in the heart of the Old Town, 500 meters from the Old Town Square and the Prague astronomical clock. Situated among the winding cobblestone streets that make Prague so atmospheric, the Rybna 24 Apartment building is located in between Old Town Square and Republic Square. The apartments are located on the top floor of a building with an elevator. 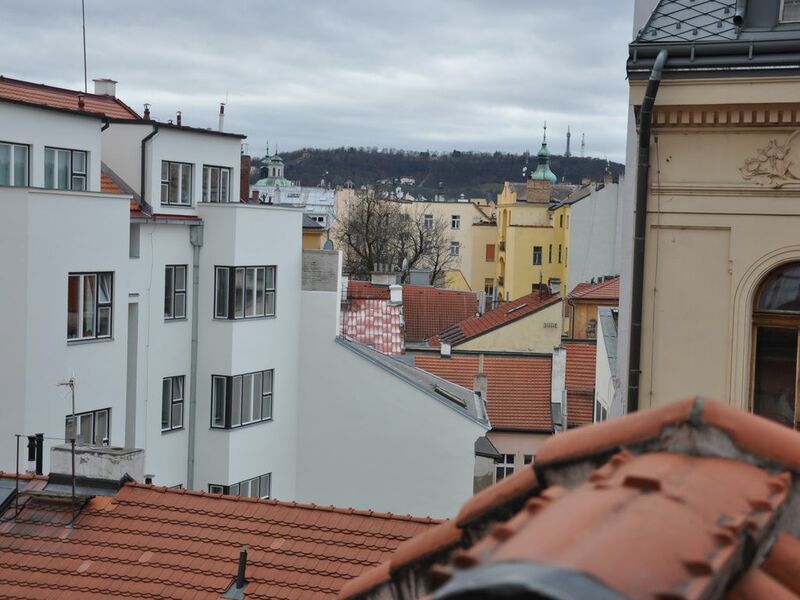 From the windows of the bedroom overlook the gorgeous roofs of Prague. Namesti Republiky is 100 meters away, Charles Bridge is 1 km from the property and Prague Castle can be reached in a 15-minute walk. The Namesti Republiky Metro Stop is 200 meters from the apartments and Main Train Station is 1 km away. All the best restaurants, taverns, bars, cafes and clubs are in the immediate vicinity of the apartment. You can discover and enjoy the city centre by walking directly from this location and access to all touristic sites. Shopping centers Palladium and Kotva about 3 min walk. In the whole Apartment Rybna 24 is smoking prohibited. You don’t need to live like a tourist while you visit Prague; you can live in a real apartment in the center of town. We have just renovated this apartment, and i can promised that the unit is clean & comfortable. The apartment has TV, WiFi and air conditioning, as well as a washing machine and dryer. The apartments are designed for 2 persons, but can accommodate 4 persons. There are 1 double bed and one pull out couch for 2 people as well, wardrobe, TV, coffee table with armchairs. Fully equipped kitchen, with cooker, fridge, kettle, plates, cutlery, glasses. Fully equipped kitchen, with cooker, fridge, kettle, plates, cutlery, glasses. I and my wife stayed for 4 nights starting Oct.1, 2018. The apartment was located at the north-eastern part of the old town of Prague. The famous Charles bridge was 10min walk and Old City Center was 5min walk, and also a gigantic shopping mall, Pavillion, is also 5 min walk. Noted is that the tram#15 (3min walk) takes us to Malostranska, which is a base to visit Prague castle. Thus, the apartment was very conveniently located. Our flight was very delayed, and we arrived at the apartment after midnight. Elena with her husband were very kind to meet us in front of the apartment. The only complaint was we could not find any heating system in the apartment. Since the period we stayed was early October, and usually no heating may be necessary. But the outside temperature dropped to 2 degrees C, and the room was a little bit chilly. Anyway, we enjoyed 4 days in Prague to our utmost. Thank you. Good in general, very clean and good location, very close to many popular places in the city. very convenient, clean, and everything within walking distance. This is a great apartment - very clean and very well-taken care of (with a number of nice little touches). It's a great location - close to high-density tourist areas but away from the hordes of summer tourists. Very clean and cute apartment close to old town square. Good access to trams and Metro. Within walking distance to many attractions.